last week, i discovered that the quality of the lm386 amp could be vastly improved by increasing the operating voltage. in so doing, i increased the headroom considerably. 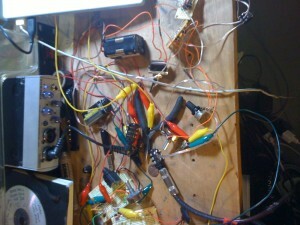 i am currently supplying 20v to the amp. 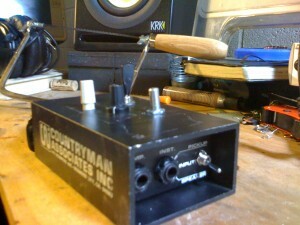 i implemented the amp in a simple feedback instrument, pictured below. 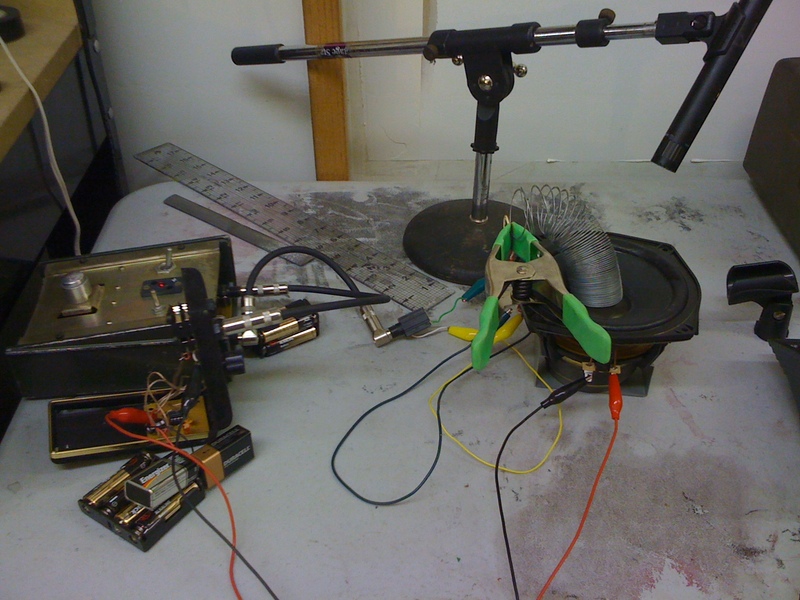 by coupling the slinky to the contact mic, and draping it over the speaker cone, feedback is produced. there is also a small stone phaser - which i've fixed for someone- involved. 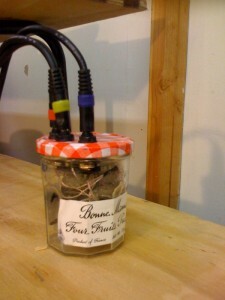 click here to listen to sinewaves pumping through this jar. click here to listen to 3 minutes of carl sagan's cosmos pumping through this jar. a few people who caught the concert at theaterlab on sunday made remarks about the above piece of handmade equipment, so i thought i'd explain it in this post. ring modulation, theoretically speaking, refers to the multiplication of two signals. in a software system, depending on your context, the same term can sometimes apply to somewhat more complex operations such as the product plus the sum of two signals. 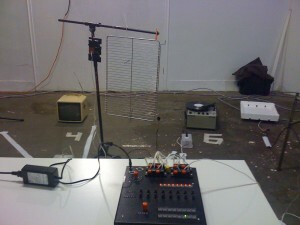 some software synthesis environments, such as supercollider, have a bevy of ring modulation operators, since the mathematical implementation may change depending on the intended application. 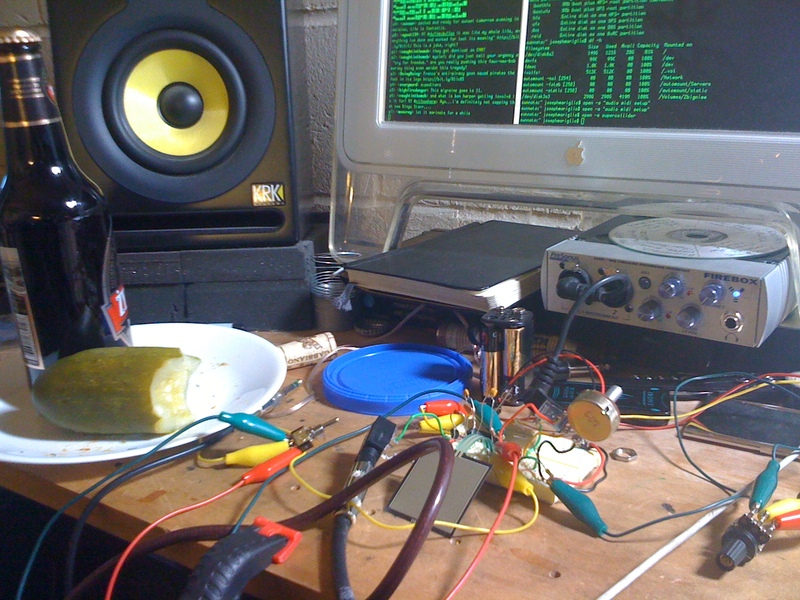 the preserves jar contains the original ring modulation circuit. the term 'ring modulation' in fact comes from the diode ring through which the signals pass, after going through center-tapped transformers. this particular ring mod uses two fairly high-quality, vintage transformers, and the diode ring is made from four vintage germanium diodes, desoldered from some ancient piece of gear. my source for parts is richard matthews, bob seer's tech, who works out of a massive unmarked garage in greenpoint. love that guy. while i can't tell you exactly what it does from a mathematical standpoint, i can tell you that it's not any of those definitions i mentioned above. germanium diodes have a particularly crunchy sound to them, which is why they are so sought after for distortion circuits. i don't think i could satisfactorily model this effect in software. n.b. the carl sagan recording introduced some weird buffer artifacts, so while it still sounds cool, the sinewaves do a better job of demonstrating the effect. 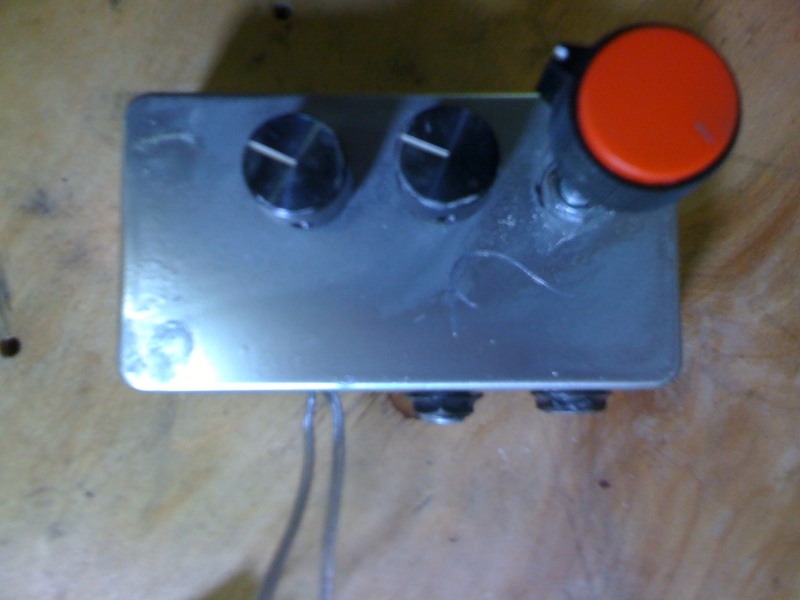 here's a finished version of that distortion pedal (the overdrive, not the filter) i was talking about in a previous post. click here to listen to the mp3. big thanks goes out to my flatmate jake for playing his bass through it. 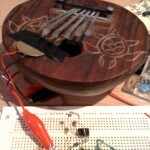 many people who have run into me at festivals are familiar with 'balu,' that lovable little handheld noise synth that reacts to light. for ages now, people have been asking me to make them their own similar synths. since i have a lot of trouble turning people down, the waitlist for these things is rather long. however, a few proud friends of mine already have received theirs for occasions such as boxing day and shark week. the above synth is for a friend of mine who lives in atlanta. behind me, as i do the demo, you'll notice the original balu, sitting on my workbench. he needed a new switch, and now he's good as new! 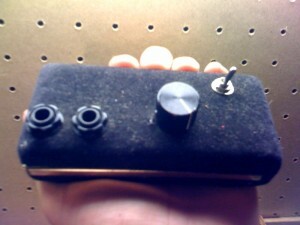 i made another distortion circuit. this one is very stable, and very loud. based on my limited understanding of the subject, this one works by overdriving the components inside the opamp, rather than using a diode to clip the peaks of the waveform. despite how primitive and brutal this circuit is, it doesn't do much self-oscillating, and actually gates a lot of low-level signal, which is a good thing when dealing with amps and guitars. actually, the gain is so high on the output that i believe it will need a third opamp to attenuate the signal, because otherwise any guitar player who uses it will most likely just destroy their amp. to test this and future pedals i'll be using an actual electric guitar, since the impedance isn't quite the same coming from a contact-mic'ed kalimba. it's an american strat-- not mine-- and i have almost no competence with the instrument anymore. regardless, i refuse to tune it, because i really like the sound of a well-detuned guitar. this pedal currently has no knobs or switches; it can only be on or off. eventually, a volume control and wet / dry knob might make an appearance. 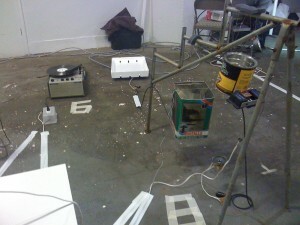 improvisation on hacked reverb unit. ah the yamaha r1000. possibly the worst digital reverb ever invented. it has four discrete settings which are labeled, cryptically, 1 through 4. it sounds nothing like reverb. it was a gift from my flatmate. i've been looking forward to hacking this thing for some time, and it has not disappointed me. last night i almost killed it completely. i was messing with it manually and decided i wanted to use bare metal to bend the circuit instead of my hands. big mistake. everything got really cool for about fifteen seconds, and then all went dark and the sound got somewhat less cool. then it wouldn't fully turn back on. i rued the day. today i woke up and tested the four fuses in the non-power-oriented part of the circuit, and found that all of them had been blown out. on replacing them, the unit sprang back to life. sort of. more accurately, its zombified body sprang into soulless action. 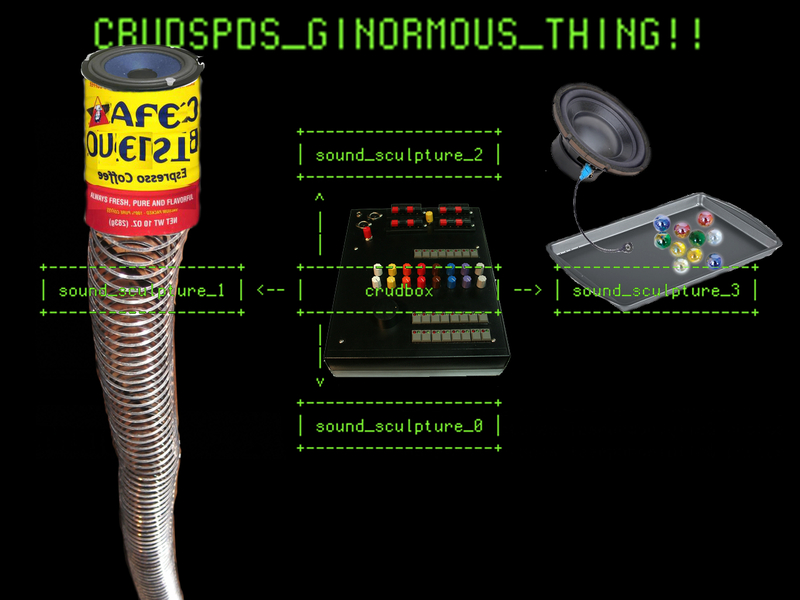 it no longer works as a reverb unit- which it sucked at anyway, let's face it - and now only works as a hacked instrument. it's probably my favorite instrument in my rig now, if only because it's so massive and novel. i spent today isolating interesting regions on the circuit and getting some chops on the board. i practiced until my hands started bleeding and i had to stop. i still have a ways to go. 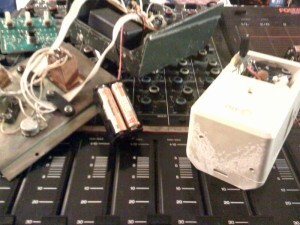 i have been playing with this reel-to-reel, which i fixed for one of my clients, for the past few days. 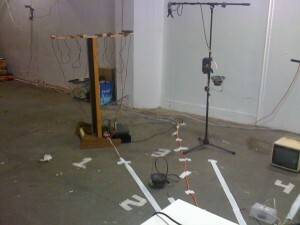 it has been an amazing experience working with tape. for the recording, i used only analogue equipment, most predominantly, an ancient and tortured fostex mixer that i used for "no input" mixing. additionally, i used a hacked small stone analogue phaser, some commercial distortion pedal, and two of my own pedals: a distorted bandpass kind of thing, and an arpeggiating octave divider. there is also some amplified spring in there. when i finished the improvisation, i digitized several versions of the tape, with slight variations in mix, tape speed, and additional slinky reverb. i arranged these different versions so they would line up at some points, creating a manual flange / delay effect. truly beautiful things happen to tape when you overdrive it. the tone is so dark and warm. i'm considering recording some computer music to tape and re-digitizing it, just for the saturation. i don't want to give it back! 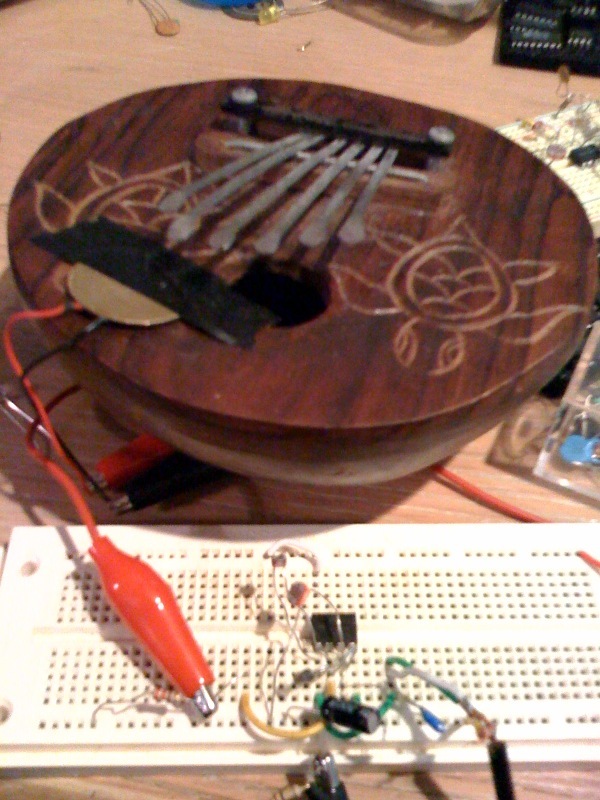 yeah -Â that one pedal's housing is from an old-school motion detector.Â that's the octave arpeggiator, otherwise known as the lunar lounge 2025.
today i made a battery-powered amplifier out of an LM386 chip and some other, mostly recycled components.Â the schematic i used can be found in the datasheet (it's a pdf).Â i went for the 200x gain circuit.Â it's housed in what appears to be a jewelery box, but really it was a container for one of those space pens.Â funny how during the space race the americans thought space pens were such an important design problem, while the soviets used pencil.Â maybe that's just an urban legend.Â i don't know. the easy access this case provides is certainly a bonus.Â i will definitely be improving on the circuit as time progresses.Â i decided to house the amp so neatly because it's something that comes in handy often. i'm calling the track that resulted from improvising with all this "a slow, hopeless fire. "Â it's a bit aggressive.Â i'm still pretty angry about the most recent hand i've been dealt.Â this is the most constructive thing i can think to do about it.Â enough said. aside from a little dynamics processing, everything was improvised and totally analogue.Â the sound comes from feedback from the little speaker -driven by the new amp- through the spring, and that crazy filter.Â i think i'll house that thing the next night i spend here in my studio, which unfortunately won't be for a few days.Â it's just as well; there's plenty of computer music to make, too! to make the previous circuit, simply replace the photoresistor that connects the input to ground (the one at the top of the schematic) with a 220 MÎ© resistor, and remove the 220 Î¼F capacitor. for my fourth hackpact, i decided to go with something electronic.Â i spent a while getting back into the workflow; it's especially difficult because I'm at my parents' house and not at my typical space.Â i ended up prototyping a simple active filter / distortion effect from an op-amp and a few other components.Â using a piezodisc as a pickup, i tested the circuit with a kalimba i found.Â i believe it's from a resort gift shop in jamaica.Â i'll draw up a schematic tomorrow.